Creating wildlife needlepoint pillows is not as difficult as you might think. If you enjoy needlework and would like to make beautiful throw pillows to decorate your home, to give as gifts, or to sell, you'll be pleasantly surprised by the wide selection of kits and canvases available to help you get started. Wildlife needlepoint pillows are a beautiful addition to the décor of any traditional or rustic room, as well as for nurseries and children's rooms. With kits available in many different designs and styles, it's easy to find one that will work in just about any space. These beautiful hand crafted pillows are ideal for sofas or loveseats, and they make lovely finishing touches for well outfitted beds. Austintatious Offerings specializes in rare and hard-to find needlepoint canvases and kits, and carries numerous wildlife selections. 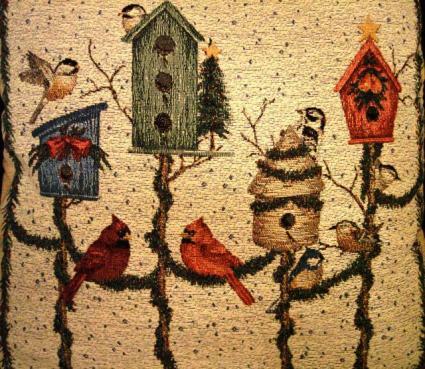 Herrschners carries a wide selection of needlepoint pillow kits, including a variety of birds, animals, and flowers, and sea creatures. When you start shopping for the materials you will need to create your wildlife needlepoint pillows, you are likely to come across both canvases and kits. It's important to understand the difference between these two options, so that you don't get home and find that you don't have everything you need to start and finish your project.Whether a kit or a canvas is better for you is simply a matter of personal preference. When you choose a needlepoint pillow kit, you're purchasing everything necessary to create a finished pillow, including the canvas, the stuffing, the backing, and all necessary supplies. For beginners, a kit is often the best choice, because there is no guesswork involved with choosing the right materials to complete the project. When you purchase a canvas, however, all you are buying is the actual fabric imprinted with the design you will stitch. You'll need to buy additional items needed to finish the project separately, unless you already have them. If you're an experienced needlepoint crafter, you may have a stockpile of needlepoint supplies in your crafting room at home that contains everything you could possibly need to finish your pillows. If you do purchase a canvas instead of a kit, be sure to thoroughly read the instructions and supply list so that you don't find yourself stuck without something you need in the middle of the project.